Regarded as one of the best varieties, Thryptomene ‘FC Payne’ is long flowering with masses of flowers. It is valued by florists and also makes a great garden plant. It has a natural open shrubby habit with arching stems. It can be pruned to shape if required and the best time to do this is in early spring. Bred by FC Payne at the Sanctuary Nursery in South Australia. In the garden use ‘FC’ Payne to attract bees, butterflies and insects, it also makes a good low growing background plant in a native or cottage garden. 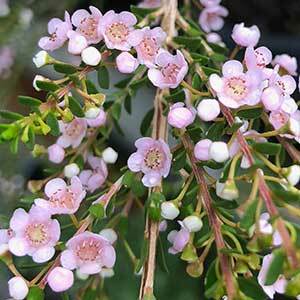 In a well drained soil and a position that has good sun to a little shade this is a very easy care evergreen plant. It is frost tolerant, drought tolerant and makes a great background plant in the garden border. Thryptomene ‘FC’ Payne along with other species is also suited for use as a low informal hedge or border plant. Soil – Well drained sandy loam or native plant potting mix in containers. Flowering Time – Spring to Winter. Foliage – Mid green and aromatic when rubbed.